Over the last 10 years, lithium has become a hot commodity due to its significant role in the production of lithium-ion batteries. Market projections show that the renewable energy industry will need more lithium carbonate and lithium hydroxide, the raw materials required to produce cathode material, which is typically used in the production of rechargeable lithium batteries. Many junior and mid-tier exploration companies recognise this as an opportunity to refresh and expand their exploration portfolio, raise money and find the new deposits. Finding a good prospect is key for the success of every exploration company. Joint venture deals, mergers, and acquisitions are part of the life cycle of a junior exploration company and more and more investors are financing the acquisition of lithium prospects. There are now hundreds of different mineral prospects for sale and advertised online – some can even be found on Kijiji! One of the main sources for lithium is pegmatite crystals. A pegmatite is an igneous rock that is created underground when interlocking crystals form during the final stages of a magma chamber’s cooling. The name pegmatite has nothing to do with the mineral composition of the rock, but rather describes a rock’s physical structure. To be called a pegmatite, the rock should be composed almost entirely of crystals that are at least one centimetre in diameter. Pegmatite lithium deposits, also known as hard-rock lithium deposits, can contain a number of elements, including lithium, tin, tantalum and niobium. Lithium is extracted from hard-rock lithium deposits using conventional open-pit or underground mining techniques with the mineral processed and concentrated using a variety of methods prior to direct use or further processing into lithium compounds, such as lithium carbonate or lithium hydroxide. If a company or individual wants to explore for hard-rock lithium, or any other commodity, usually there are two choices: either acquiring a brown field project or finding an area with good potential for lithium-bearing pegmatites and applying for an exploration licence or staking the ground. Lithium-bearing pegmatites are not easily identified with airborne geophysical surveys, so the acquisition of a brown field exploration project may be an attractive way forward. The company can review historical mining records, find lithium past producers and negotiate to acquire the property from the current land owner or licensee. Property acquisition should include a site visit for a high level or in-depth due diligence. Pegmatites are quite easily recognized if there is an outcrop or other rock exposure. Relatively large crystals of lepidolite (purple to pink mica), spodumene, petalite, quartz, feldspar or the presence of holmquistite (violet to blue amphibole (Li2)(Mg3Al2)(Si8O22)(OH)2) in the host rocks are a good indication that the property is within a pegmatite field. Are All Lithium Pegmatites Equal? Recently, a junior exploration company was planning to apply for an exploration licence that would encompass a former lithium mine in Uganda. 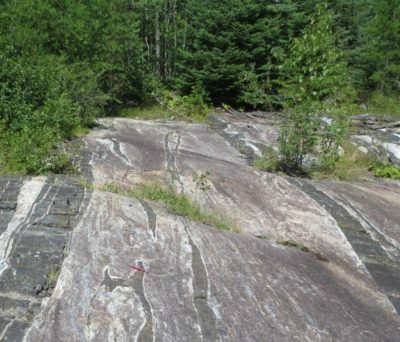 Before submitting the application, its exploration team conducted a short sampling program of a pegmatite that hosted a historical columbite-tantalite-lithium mine. The pegmatite around the entrance of the mine was sampled and 32 grab samples were sent to a reputable laboratory in South Africa. The samples were processed using sodium peroxide fusion with ICP-MS finish. The results varied from 14 ppm Li to 8,270 ppm (0.83% Li or 1.78% LiO2) and the acquisition of the property seemed to be the next step. In the meantime, five field duplicate samples were sent to Dorfner ANZAPLAN (a specialist in testing and engineering services based in Germany) for ICP-MS and whole rock analyses. The Li content ranged from <50 mg/kg (below the detection limit) up to 8,430 mg/kg (0.84%Li or 1.81% LiO2). These results verified the elemental analyses from the South African laboratory. In addition to elemental analysis, these samples were analysed using X-Ray Diffraction (XRD) to identify the mineral composition of the samples. The richest sample from the pegmatite returned the best results (1.81% Li2O), which compared well with the corresponding chemical analyses. The XRD analyses clearly showed the Li-bearing mineral to be a phosphate, from amblygonite (LiAl(PO4)OH)–montebrasite (LiAl(PO4)F) series. Montebrasite is a fluophosphate containing aluminum and lithium and is common in pegmatites in Manitoba (Canada), California (USA) and Uganda. The big clear crystals are used as semi-precious gemstones, while non-gem quality occurrences are used as a source of alumina phosphate and lithium in the ceramics industry. Despite being a high-grade lithium pegmatite, the presence of fluorine (F) in the montebrasite could compromise the quality of lithium compounds for the battery industry. At present, therefore, this type of pegmatite rock is not used as a source for the production of lithium chemicals for lithium-ion batteries and proves that not all lithium hard-rock deposits are equal in respect to the lithium battery market. The difference in the mineral composition and the ratio between the different minerals will significantly affect their potential for acceptance for use by the lithium battery market and, thus, the value of the lithium prospect. As the example discussed above demonstrates, a simple XRD test early in the exploration phase can prevent the project owner or investor from wasted efforts by mistakenly exploring for, or investing in, a common industrial mineral. Although lithium may have become a hot commodity, finding a good prospect that yields the necessary mineral composition to produce lithium carbonate and lithium hydroxide for the battery market is the key to success.